There are more than 30 native-owned banks and credit unions serving underserved communities all across America. Because of these native-owned financial institutions, many people living on or near tribal reservations now have access to credit. But for many others, access to financial products like loans or credit cards is often out of reach. Credit deserts, or areas with little access to credit, are an unfortunate reality for many Americans, especially for those who live near or on Indian reservations. According to research by Randall K.Q. Akee and Miriam Jorgensen, the average distance from the center of a tribal reservation to the nearest bank is 12.2 miles and the average distance to the nearest ATM is 6.9 miles. Those who live on tribal reservations may have to travel more than 60 miles to reach the nearest bank or ATM. In contrast, the average distance for those not living on a tribal reservation must travel approximately 0.01 miles to reach an ATM. There are many severe and long-lasting consequences of living in credit deserts. For instance, those who live in areas with few financial institutions are 20 percent more likely to be credit invisible (i.e. lacking a credit score) and experience higher delinquency rates on average. These negative effects are similar to having a $6,000 reduction in annual income. Those who have the means to move to an area with a more robust financial presence can partially offset these negative consequences of living in a credit desert, but researchers have found that it can take nearly two decades to completely negate the negative effects. For many Americans living on or near reservations, moving away from their families, friends, and community may not be an option, which has led many tribes and tribal members to build their own banks and credit unions to help serve their local communities. 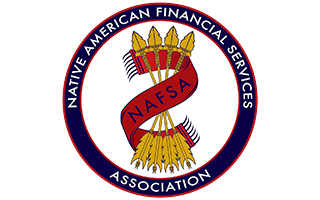 In addition to banks, there are also native-owned and native-serving credit unions that are providing financial services to underserved communities. For example, the Lac Courte Oreilles (LCO) Federal Credit Union serves the people in the LCO community by helping residents accumulate savings, educating members on the value of credit, and developing a secure and accessible financial institution for the entire community. Many of these native-owned banks and credit unions have made substantial progress in serving their local communities. Though more can be done, research indicates that the creditworthiness of those who live on or near tribal reservations have been slowly improving over time.